It’s been a month since I had written Part II of this tutorial back in Hungary, and Christmas is now a few days ahead. By now, Sekaiju 3.4 is already released with a few added features and bug fixes. So now, I finally had enough pressure to finish the Silent Night midi project I’m working on. One of the reasons for this great delay is that I would rather use other free music notation tools such as MuseScore, Finale Notepad or Musink which I just recently discovered. Another is I would guess that many DAW oriented users do most of their work through the Piano Roll, which was already discussed. Anyway, enough of these excuses. Let’s just finish this tutorial series and enjoy the holidays! Sekaiju Tutorial: User Interface to learn the basics of using the Sekaiju MIDI editor. Sekaiju tutorial: A simple example (Part I) which tells how to start making a MIDI file. 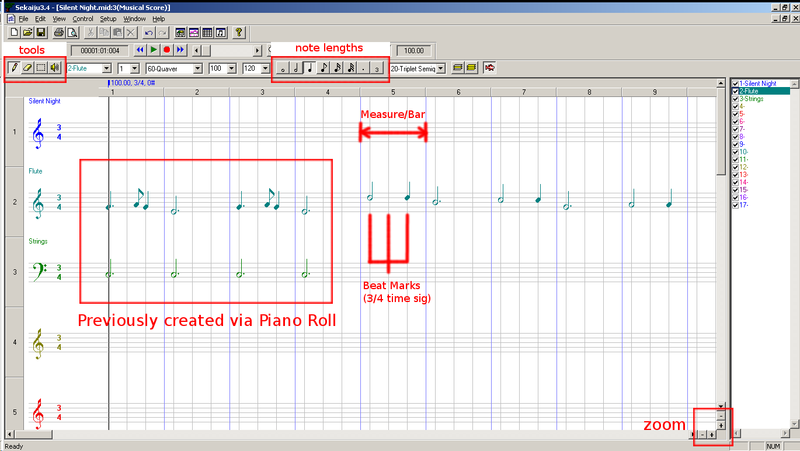 Sekaiju tutorial: A simple example (Part II) which discusses note entry via the Piano roll. Again, here is the basis of the MIDI file we’re building from scratch. Since this part would be about using the Musical score editor, we just copy the score directly as we see it. Perhaps, one motivation for using a MIDI editor instead of a dedicated notation editor is that you can further tweak the notes in the Piano roll, deviating a bit from notation to make it sound more human and expressive, since as I had mentioned before, MIDI and music notation are not equivalent. As we chose the key of C, there is no key signature indicated on the score. If you have the file (from the previous tutorials) opened, a Musical Score representation can be shown by selecting the “Show new Musical Score Window” button (♫) in the main toolbar or in the “View” menu. Minus the Line tool, the editing tools in the Musical Score window are mostly identical to those found on the Piano Roll. The major difference is that you can not resize a note by dragging. Instead, you select the notation symbols that correspond to the note length you want to use. Toolbar Buttons found in both Musical Score and Piano Roll windows. From left to right:Pen, Erase, Select and Preview. Selects multiple notes and allows multiple notes to be simultaneously moved. These buttons determine the length of the note that is added when using the Pen Tool. The first 6 buttons, are the (common?) note lengths.While the last two, the “dot” and “triplet” modifies whichever note you have selected among the first 6 buttons. Entering notes through the Musical Score interface. 1. From our previous work, look at the staff corresponding to the Flute track. It should be easy with the tracks labeled. There is no need to explicitly select the track as notes are entered on the staff that you click, and the staves are already separated for each instrument (unlike in the Piano Roll where all the track’s notes are using the same workspace). If you add a note on a staff of a different instrument, that instrument’s track gets selected. 2. Zoom to a comfortable level by clicking the plus or minus (“+” or “-“) buttons at the lower right corner along the scroll bars or by using “Ctrl +” or “Ctrl -” shortcut keys. 3. Set the position quantization. Since the smallest note is an eight note or quaver (♪) and the notes on the song are multiples of a semiquaver, we could choose 60-Quaver from Snap dropdown (third). We have to do this because, unlike other score editors, note entry is position dependent. For example, if you create a whole note on an empty bar and click somewhere in the middle, the whole note will start roughly where you clicked and go beyond the bar, causing tied notes instead. 4. Use the beat markers as guides. Note that in each bar/measure (bounded by blue vertical lines), there are 3 vertical gray lines. This indicates the beats in our 3/4 time signatured-song. Also use the measure numbers as a guide. 5. Choose the Pen tool and select a note symbol corresponding to the note length you want to enter. Since we are using a music sheet as a guide, we simply copy the note symbols as we edit. Enter the note with the correct length by clicking on the appropriate location on the staff. Remember that note entry is position dependent (like in the Piano Roll). Dotted notes and triplets are obtained by pressing down one note length then also pressing down either the dot (“.”) or triplet (“3”) buttons to modify that note length. Note entry through Sekaiju’s Musical Score window. 1. The same procedures as with the Flute track, except that you will be putting notes into the Strings staff. There is no need to explicitly select the Strings track as it already has a separate staff. Notice that it is using a bass staff which makes more sense with the notes we previously entered with the Piano Roll. As in the previous tutorial, for simplicity, I only used the root of the indicated chords in the transcription and play them an octave below the melody. Silent Night: Measures 10-21. Flute and strings. The whole song is available as a MIDI file. As the musical score editing behaves very similarly to piano roll editing some unusual things can happen. Notes can overlap. You place a note that starts before the previous note of the same pitch ends. There is no “page view” or “wrapping”. You have to scroll horizontally to see the rest of the song. There is no concept of “voices” so note entry is dependent on position. You can easily create notes that don’t have to be vertically aligned. Similarly, there is no concept of rests. For example, if you place a quarter note on an empty bar, it doesn’t necessarily have to be in the start of that bar. Notes can not be dragged-resized. Just erase and replace with the right size, or use the Piano Roll instead. I haven’t figured out how to tie notes. The last “Peace” note in Silent Night is longer than a whole note, two tied dotted half notes. Of course, this is easy to remedy in the Piano Roll. But this is one of the expected shortcomings of Musical Score editing not a main purpose of Sekaiju. Likewise, I also don’t see any quick way to flatten or sharpen a note. This would be used if there are accidentals in the song. This can be done of course, but not like how you normally do it in a full blown score editor. This is a very simplified version of Silent Night, as the emphasis is really getting familiar with Sekaiju. The MIDI file is available for further study. As an exercise, I would suggest completing the chords by adding thirds, fifths and sevenths instead of just the root notes (refer to a chord chart if necessary). Also the built in MIDI synth of Windows sounds too cheesy to be enjoyable. Hence, a big step (big in improvement, not so much in effort), is to use the MIDI file with Synthfont or other DAWs together with good soundfonts, VST instruments and VST effects.